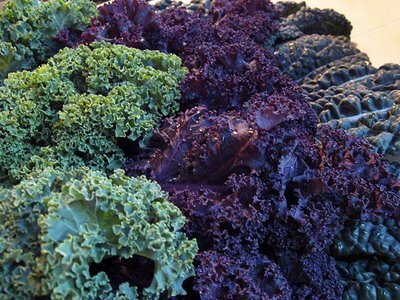 The vitamin K in kale can decrease the effectiveness of the common blood thinner, warfarin! A new study shows that two diabetes and two blood-thinning drugs account for two thirds of all emergency room visits by older Americans. The biggest culprit was the drug warfarin (Coumadin, Jantoven), commonly prescribed to prevent blood clots, which was responsible for one third of emergency hospitalizations. The other medications are insulin, antiplatelet drugs like aspirin and Plavix, and oral hypoglycemic agents. There are probably many reasons that seniors are at risk. Anyone who has an aging parent, friend or relative know how difficult it is for them to take medications correctly. To make things worse, doctors tend to overprescribe drugs to seniors. According to the authors of this study, 40% of U.S. adults over 65 years of age take 5 to 9 medications and 18% take 10 or more! No wonder seniors experience so many adverse drug reactions. Our kidneys, liver and other filtration organs in our bodies were not designed to handle this many foreign and toxic chemicals. In addition, no drug company can ever adequately test the vast combinations of all these medications. Drugs.com Drug interactions Checker (includes interactions of chosen drug(s) and food). AARP Drug Interaction Checker (includes over-the-counter drugs, herbs and supplements). Drugstore.com Drug Interaction Database (includes prescription, nonprescription, herbs, vitamins and supplements. If you have a loved one who is a senior, take the time to find out how many prescription drugs they are on and ask the doctor if they are really necessary. Years ago, when my mother-in-law came to live with us in a near-by nursing home, she was on about 15 medications. When we asked the staff why she was taking each one, they didn't have a good answer. Many times they prescribe drugs as a precaution and to avoid future lawsuits. By the time they carefully examined her medications, they reduced them to just a handful of prescriptions. Once my uncle came to visit and he brought out a huge plastic bag of prescription drugs. I went on one of the drug interaction websites and discovered than several of the drugs he was prescribed should not be taken together! But he had several different doctors and they obviously weren't talking to each other. So take things into your own hands. Challenge each prescription. Make sure they are taken regularly and consistently and check for interactions with other drugs, vitamins, herbs and food. Organic - It's Not Just What You Eat! - My Favorite "Safe" Products and Gift Ideas. 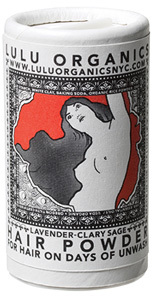 A dry shampoo without the worries of talc! In April I wrote about organic fruits and vegetables and if they are worth the extra money. Although many of us go ahead and spend more for organic foods to avoid consuming pesticide residues, we are less conscious of other ways that we expose ourselves to harmful chemicals. Think about how many products we use in or on our bodies? Shampoo, toothpaste, lotion, lip balm, shaving cream, tampons, mouth wash - and the list goes on and on. Even licking an envelope exposes you to whatever happens to be in the glue! So today, because it's a big shopping day, I'm going to share a few of my favorite products that I feel safe using on my body. One of the best things I did for myself this year was allow myself to be pampered. I started going to Amazing Face Sebastopol, where I got hooked on the most pleasurable facials in the world by Marianne Allred, the owner of the establishment. Besides knowing how to pamper, she really understands skin care products and only uses those with safe, organic ingredients. 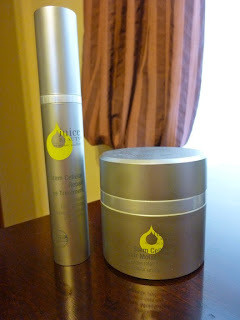 I was turned on to two product lines that she uses, which I now cannot live without! One is iLike and the other is Juice Beauty. The iLike (pronounced "ey-lee-kay) products are so fresh and natural, you feel like they just came out of your blender! Ingredients for their products are grown and harvested in the Carpathian region of Hungary. My favorite product of theirs is the Rosehip Exfoliator but, honestly, every one of their products that I have tried has been amazing. Of course it's best to support your local businesses so try to find this product locally. If you live in or near Sebastopol, you can pick these up at Amazing Face Sebastopol. If you cannot find them locally, try sites like Skinbotanica - they carry the full line of iLike products. 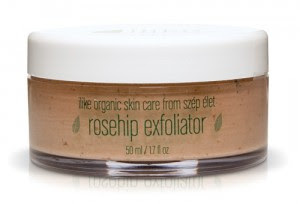 iLike Rosehip Exfoliator is my favorite but ALL of their products are truly amazing! I also fell in love with Juice Beauty, my favorite products being their Stem Cellular Repair products as well as their reflecting gloss lip color. Their moisturizer smells like fresh citrus and you can almost feel it "eating up" the free radicals on your skin! I use the Stem Cellular Repair Moisturizer , Juice Beauty Green Apple Age Defy Serum and the Stem Cellular Repair Eye Treatment. In Sebastopol, you can buy Juice Beauty products at Amazing Face Sebastopol. OK, I admit it. Some days I just don't want to wash my hair. In fact, there are many days like that. Especially in the winter when it's cold and rainy. So being able to shake a little hair powder in my hand, rub it through my hair for a few seconds and be done for the day is a blessing! Dry shampoos aren't new but they are usually made with talc. Turns out that there are serious concerns that talc can be carcinogenic. I shutter to think how I freely powdered my babies' bottoms with talcum powder without even thinking about that! Out of this concern, my daughter, Linda Aldredge, created Lulu Organics and developed a "talc free" hair powder . This dry shampoo comes in 4 delicious scents, Lavender and Clary Sage, Jasmine, Patchouli and Amber, and Vetiver and Black Pepper. They come in Full 4 oz bottles which can last a long time so they are worth the $30 price or if you want to try a few different scents, you can get the 1 oz travel size which are offered in both Lavender and Jasmine. New York Magazine listed this product in The Gift Guide 2011 - Stocking Stuffer Ideas. It was also listed as the number 1 hair powder in the Zoe Report. Follow Lulu Organics on Facebook. Lulu Organics Travel Size hair powder. I am especially worried about products that go on my lips. After all, we lick our lips all day long so whatever is on them, ends up in our body. A friend of mine whose wife suffered from celiac, went on a strict gluten free diet. When she found no relief, they discovered there was gluten in her lipstick! So we should worry about the ingredients in our lip products. My two favorite lip products are Juice Beauty Reflecting Gloss and Lulu Organics Lip Balm. So when you are thinking about stocking stuffers and holiday gift giving, think about introducing your friends and families to one of these or other "safe" products. To check out how safe your favorite cosmetics are, go to EWG's Skin Deep Cosmetics Database. 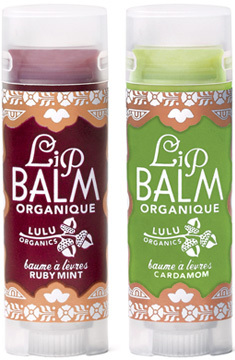 To sample some of Lulu Organics most popular products, check out the Travel Kits. The Deluxe travel kit comes with 2 of Lulu Organics Hair powders, both Lip balms and a travel soap in a Walker Dunham bag. 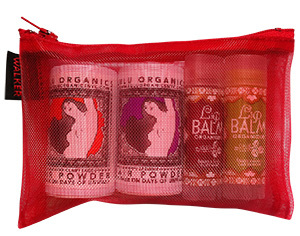 Lulu Organics Deluxe Travel Bag features Lavender + Clary Sage hair powder, Jasmine hair powder, Ruby mint lip balm, Cardamom lip balm, Lavender +Oatmeal Soap - All in a reusable Walker Dunham bag. Raw Vegan Pumpkin Chia Seed Pudding With Pecans - A Great Thanksgiving Dessert! And, It's Gluten Free! Raw Pumpkin Chia Seed Pudding with Pecans makes a healthy and delicious Thanksgiving Dessert! If you know me or follow this blog, you know that chia seed pudding is top on my family's list of favorite desserts. So I thought it would be fun to create one for Thanksgiving! Chia seeds are packed with ALA omega-3 fatty acids (7 grams per quarter cup) and they are also very high in dietary fiber (15 grams per quarter cup). If you love chia seed pudding, you will love the autumn flavors of pumpkin pie spice in this recipe! Although this pudding looks and tastes like pumpkin pudding, it's actually made with a carrot! Carrots give this a more intense "orange" color and it's the pumpkin spices that really make you think you're eating a pumpkin dessert. Carrots are also more commonly found in your refrigerator so you can make this dessert anytime. When making this dessert, shave the carrot until you get to the pithy center. Use the shavings and discard the center. I have posted many chia seed pudding recipes. The easy ones involve mixing chia seeds with prepared non-dairy milk. For example, Vanilla Chia Seed Pudding with Hemp Milk and Blueberries uses vanilla Living Harvest hemp milk (now called Tempt). Chocolate Chia Seed Pudding uses Earth Balance (or other) non-GMO chocolate soy milk. But for the creamiest chia pudding, like in my original Amazing Chia Pudding recipe, start with soaked cashews and dates. Place soaked cashews in a Vitamix or other high speed blender. Add soaked dates and the reserved soaking water, pumpkin pie spice, cinnamon, vanilla extract and stevia to the blender. Using a potato peeler, shave the outer part of the carrot into the blender until you get to the pithy center. Discard the center. You will need a very good blender, like a Vitamix, to make a smooth and creamy nut milk. The carrot gives the milk a nice, orange color. Pour the cashew-carrot milk into a one quart container. Add the dried chia seeds to the milk and stir vigorously with a fork for at least a minute. Let sit for 15 minutes and stir again until the chia seeds are well blended and no longer clump together. Stir chia seeds into the cashew carrot milk until well blended. Cover and refrigerate for at least 6 to 8 hours. I usually make this a day before I serve it. The longer it sits, the creamier it gets! Serve in small bowls and top each with 1 tablespoon of chopped pecans. Per serving: 235.1 calories, 14 g fat, 1.8 g saturated fat, 1.8 g omega-3 and 3.1 g omega-6 fatty acids, 0 mg cholesterol, 5.0 g protein, 25.9 g carbohydrates, 7.2 g dietary fiber and 16.3 g sodium. Favorite Vegan Thanksgiving Recipes - Sweet Potato Casserole, Creamy Mashed Potatoes, Cornbread Stuffing, Brussels Sprouts, Green Beans And More! 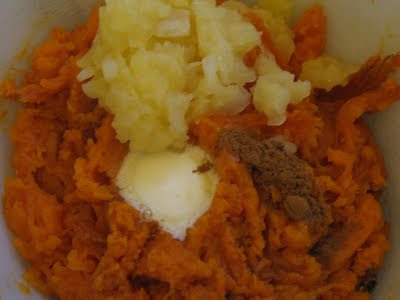 Everyone loves this simple sweet potato casserole recipe! There's something about Thanksgiving that makes you crave old favorites. Today I'm going to take you back to some of the most popular vegan Thanksgiving recipes that I've posted over the past 3 years. Just hit the links to get to the complete recipes. For those of you who are preparing turkeys and are having a mixed crowd of meat eaters, vegetarian and vegans, you'll please the most people if all of your delicious side dishes are vegan. And I guarantee you, no one will notice the difference! I've often asked myself how Thanksgiving became the "celebration of starch" with so many forms of potato dishes in addition to a bread stuffing. That said, I would never omit a single one! Let's start with my absolute favorite, Sweet Potato Casserole. I assure you, everyone will love this dish! It has no added sugar because baked sweet potatoes are naturally sweet! Although the recipe calls for baking the sweet potatoes or yams, feel free to peel and steam them if that saves you time. However, I do think baking them in their skins makes them a bit sweeter. Combine mashed sweet potatoes, crushed pineapple, Earth Balance, cinnamon and salt. Top with chopped pecans. The next thing I'm serving is this year is Creamy Vegan Mashed Potatoes and Mushroom Gravy. Soft, silken tofu replaces the heavy cream in this light, low fat, mashed potato recipe. This low fat version of creamy mashed potatoes only has 109 calories per serving and just a few grams of fat! I've always favored cornbread for my stuffing. Here's a simple recipe for vegan cornbread and a Cornbread Stuffing Recipe that has a secret ingredient! You can start with store bought cornbread or cornbread stuffing cubes to save time. Shredded sweet potatoes add a sweet touch to this stuffing! Brussels sprouts are my all time favorite holiday veggie but I alway make green beans too for those who don't share my enthusiasm for the petite cabbage. For a spicy, roasted vegetable, try my recently posted Roasted Brussels Sprouts with Crushed Red Chili Flakes. Another way to make them that is very simple and delicious and gives them a creamy texture is Brussels Sprouts with Garlic. For a light and festive salad, you can make Raw Vegan Brussels Sprouts with Orange Chia Seed Vinaigrette and Cranberries. Roasted Brussels Sprouts with Crushed Red Chili Flakes. By steaming before roasting, you can use less oil. These garlicky Brussels sprouts have a creamy texture. Brussels Sprouts Salad with Orange Chia Seed Vinaigrette and Cranberries. This colorful raw salad is light and festive. Growing up in an Italian home, our green beans were always tossed in olive oil, lemon juice, fresh garlic and some seasonings. I've been making them that way every since! 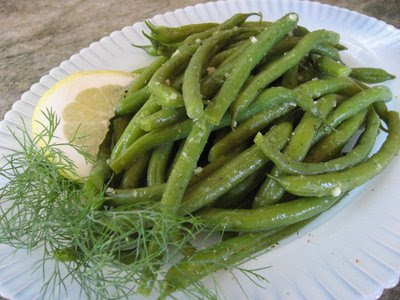 Here's a simple recipe for Fresh Green Beans with Garlic, Lemon and Dill. They can be served warm or at room temperature. 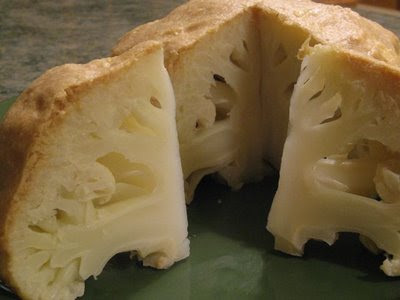 Though not a Thanksgiving classic, this cauliflower recipe is very elegant and it slices well for individual servings. If your guests are cauliflower fans, try this Lemon Tahini Encrusted Baked Cauliflower. Hope you enjoy these classic Thanksgiving recipes! Last weekend Doug and I had a lovely dinner at Sarah's Forestville Kitchen. Forestville is about 6 miles down the road from Sebastopol so when a Living Social deal came out for this restaurant, we grabbed it. One of the things we ordered was a Sauteed Brussels Sprouts appetizer. They were spicy and crispy and even my husband loved them and he's not a fan of this particular vegetable. The only problem was that they were a bit oily. But to brown them in a skillet, it's going to take more oil. I wanted to try and duplicate this wonderful flavor but with a little less oil so I decided to roast them instead. There's a popular roasted Brussels sprout recipe floating around the internet that just simply mixes the Brussels sprouts with a bunch of oil and roasts them until they are cooked. The problem is, Brussels sprouts are hard little balls and it takes a high temperature and a good bit of time to cook them. In fact, by the time the Brussels sprouts were cooked, they looked like little incinerated balls. Many people commented how much they enjoyed the "caramelization" but to me, it looked and tasted burnt. By pre-steaming the Brussels sprouts, I was able to roast them for a shorter amount of time and with less oil. In fact, I steamed them until they were cooked exactly to my liking (fork tender but not falling apart). Then I mixed them in oil and seasonings, spread them out on a cookie sheet and roasted them until they were brown. Once brown, I removed them from the oven, squeezed some fresh lemon juice over them and served them. Heat oil and mix in crushed red pepper flakes. Spread out on a cookie sheet and roast in oven until brown. Clean Brussels sprouts by cutting about a quarter inch off the bottom, removing any damaged outer leaves and wash.
Cut each Brussels sprout in half and place in a steamer. Cook until fork tender. Heat oil in a frying pan. Stir crushed red pepper flakes into the heated oil and immediately remove pan from heat. Let cool a bit. Stir in cooked Brussels sprouts and sprinkle with garlic and salt. Mix well. Spread out on cookie sheet or shallow roasting pan. Roast in oven until brown - about 30 minutes, turning over half way through. When done, remove from oven and squeeze a little fresh lemon juice over the Brussels sprouts. Serve immediately. Per serving: 87.8 calories, 5.1 g fat, 0.7 g saturated fat, 145 mg omega-3 and 488 mg omega-6 fatty acid, 0 mg cholesterol, 3.6 g protein, 10 g carbohydrates, 4.4 g dietary fiber and 125 mg sodium. Panel Urges Testing Kid's Cholesterol - You've Got To Be Kidding! Protecting our kids or another excuse to make $$ ? I was going to spend my day happily creating more Thanksgiving recipes until I read the article on cholesterol testing for children. I already heard about it on the news but seeing it in print this morning just reignited my disgust. In case you haven't heard, new guidelines issued by an "expert panel" appointed by the National Heart, Lung and Blood Institute recommend that EVERY child should be tested for high cholesterol between the ages of 9 and 11. The American Academy of Pediatrics also endorsed it. I ask myself, "just how many free trips to Hawaii can Pfizer afford to give away?" Ironically, many experts feel that testing C-reactive protein, not cholesterol, is a better way to predict future cardiovascular disease. * Knowing a child's cholesterol level could be helpful. (What would be even MORE helpful would be to ask them about their diet and how much time they spend exercising!). * The reason for testing everyone is that targeted screening doesn't work. * High cholesterol in children would be addressed with diet and exercise. * Less than 1% of children would end up taking statins. According to the Associated Press, "several doctors on the guideline panel have received consulting fees or have had other financial ties to makers of cholesterol medications". Not a surprise, I'm sad to say. How these self serving and unethical practices continue to be tolerated is beyond me. Besides the obvious winners, the pharmaceutical companies who will no doubt be selling statins to a new group of young clients for many decades, there's a ton of money to be made on the tests themselves. A lab test screening for cholesterol costs around $80 and if they test for triglycerides, that's another $30 to $50. Multiply that by every 9 year old child in America, and we're talking serious money. But at the end of the day, we will be footing the bill for this unnecessary protocol. The insurance companies will have to reimburse for this (since it's now "officially" a guideline) and our insurance premiums will no doubt go even higher! Once a person takes statins, they rarely get off of them. So if someone begins this regimen as a child, they have many years of taking this powerful medication ahead of them. There are serious concerns about what risks a person faces with decades of statin use. The risks associated with the statin, Lipitor, are not something I would ever want to subject my children to! Talk to your doctor or pharmacist if you have side effects that bother you or that will not go away. These are not all the side effects of LIPITOR. Ask your doctor or pharmacist for a complete list. (OMG, this isn't a complete list!) Do you REALLY want to expose your child to this? * Spend more time training doctors about nutrition and have them ask about children's diet and exercise level during visits. * If a child is overweight, have a serious discussion with the parents to encourage them to provide adequate nutrition and encouragement for a better lifestyle. * Instead of spending $80 on cholesterol screening, refer the patient to a counseling session with a nutritionist. * If any tests should be given, it should be vitamin panel to check for 25-hydroxy vitamin D levels and other vitamin and mineral deficiencies. * Encourage the schools to provide a more healthful school lunch and exercise programs. An "expert panel" from the medical community with a useful recommendation like that would go a long way. 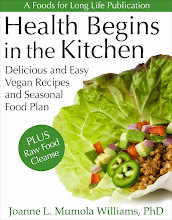 OK, now that I've got that off my chest, I'm going off to develop some yummy and healthy Thanksgiving recipes for you! Picture that it's Thanksgiving morning and you already have a house full of guests. You have a busy day of chopping and cooking ahead of you so you don't really have time to prepare a big and complicated breakfast. So start the day off right with a festive bowl of oatmeal bursting with fresh cranberries and pears and a sprinkling of chopped, raw, Texas pecans! It will only take a few minutes and this hearty breakfast will carry you through the morning. What's different about this oatmeal is the wonderful flavor of fresh fruit. Unlike dried cranberries, raw ones burst in the oatmeal giving a fresh and slightly tart flavor. This tartness is offset by a nice, ripe pear and a touch of stevia. Nothing says Thanksgiving more than fresh cranberries. Besides their wonderful flavor, they are a "phytonutrient stew" containing 5 different categories of healthful plant chemicals: anthocyanins, flavonoids, phenolic acids, proanthocyanidins and triterpenoids. Although many have flocked to supplements of cranberry extracts or cranberry juice, the "whole" cranberry provides the most health benefits. Just about every woman knows that cranberries protect against urinary tract infections, but their anti-inflammatory and antioxidant properties also play a role in lowering the risk of heart disease, periodontal disease, stomach ulcers, colon cancer and more. Check out my recipes for Raw Cranberry Relish and Low Sugar Cranberry Sauce. Purchase bags of cranberries when in season and throw them in the freezer for use all year long! In a saucepan, bring water, vanilla extract and cranberries to a boil. Lower heat, cover and cook for 2 minutes. Mix oatmeal, oat bran, salt, cinnamon and stevia in a bowl. Bring water back to a boil and add oatmeal mixture. Cook uncovered on medium low heat for 4 minutes, stirring occasionally. Stir in diced pears and cook for another 2 minutes or until oatmeal thickens. Turn off the heat, cover and let sit for 2 minutes. Stir well and pour into 4 bowls. Top each with 1 tablespoon of chopped pecans and serve immediately. Per serving: 188.7 calories, 7 g fat, 0.8 g saturated fat, 0.1 g omega-3 and 2.2 g omega-6 fatty acid, 5.6 g protein, 31.9 g carbohydrates, 6.8 g dietary fiber and 148 mg sodium. Crisps - The Perfect Dessert! I love fruit crisps. When they are baked, they fill the house with yummy aromas. When they are raw, they truly capture the flavor of the fresh fruit. As the holidays approach, consider serving a fresh crisp! Last fall I posted a raw Pear and Apple Crisp with Raisins. Today's crisp uses Asian pears, fresh raspberries and an omega-3 rich crumble made from English walnuts and hempseeds. I think you're going to love it! It's so fresh and healthy, I just ate the leftovers for breakfast! Unlike my other crisp recipes, this one is easier. I made a quick crumble to sprinkle under and over the fruit and that's it, we're done! I wanted to limit the handling of the fruit as the raspberries are so delicate. There were some beautiful Asian pears in the grocery store this weekend. If you haven't had one of these wonderful fruits yet, you should try them. Unlike traditional pears, they are firm when ripe (more like an apple), crisp and far less perishable. I usually make crumble topping with English walnuts, almonds or other raw nuts. Today's recipe uses a combination of walnuts and one of my favorite "power seeds", raw hemp seeds. Hemp seeds are tender with a nutty flavor and unlike chia or flaxseeds, they don't need soaking. I sprinkle them on fruit or green salads, on oatmeal and cream of wheat and occasionally I just eat them out of the package with a spoon! They are a wonderful source of ALA omega-3 fatty acids and they contain a surprising amount of high quality "complete" protein. Three tablespoons of hemp seeds has as much protein as 2 medium eggs! So the next time someone asks you, "where do you get your protein", tell them you eat hemp seeds! One of my favorite brands is Nutiva organic shelled hempseeds. To make the crumble topping, place walnuts, dates, cinnamon and salt in a food processor with an S blade and process until the mixture begins to stick together. Add hemp seeds and coconut and briefly process to incorporate. Set aside. Prepare pears and place them in a large bowl and toss with Fruit-Fresh product protector or lemon juice to prevent discoloration. Gently fold in raspberries. Sprinkle 1/2 cup of the prepared crumble topping on the bottom of a 9 inch round pie pan or an 8"x8" square pan. Spread all the fruit over the crumble making sure the raspberries are evenly distributed. Sprinkle the remaining crumble topping over the fruit. Cover with plastic wrap and refrigerate or serve immediately. Raspberries are very perishable so eat within 1 or 2 days. Per serving: 180.8 calories, 10.9 g fat, 1.7 g saturated fat, 1.6 g omega-3 and 5.4 g omega-6 fatty acids, 0 mg cholesterol, 4.8 g protein, 18.7 g carbohydrates, 5.9 g dietary fiber and 59 mg sodium. What's a holiday dinner without a spud? One of my favorites, of course, is low fat, creamy vegan mashed potatoes with mushroom gravy. And one of the most popular holiday potato dishes on the site is the vegan sweet potato casserole which I also make EVERY Thanksgiving. Actually, I make it all winter long! But the "twice baked" potato can be a good holiday dish because you can make the little guys early in the day and just bake them right before dinner. I suggest you give them a try before the holidays since it's not a good idea to experiment with new recipes when you have a house full of company! A mistake I've made a few times in my life. Even though they look pretty "cheesy", and I don't mean that in a bad way, the cheddar effect comes from a healthy dose of butternut squash! (Yet another way to sneak more veggies into an unsuspecting crowd!) A heaping tablespoon of Vegetarian Formula nutritional yeast gives it a cheese like flavor in addition to all the critical B vitamins it contains. Scrub potatoes and poke each one several times with a fork so they don't explode while cooking. Place directly on the middle rack of a preheated oven for 60 to 70 minutes or until insides are soft. While potatoes are baking, steam butternut squash until soft, about 15 minutes. Drain and set aside. When potatoes are done, let cool to the touch and carefully slice in half lengthwise. Cut carefully along the edge of each potato half with a serrated knife (see picture) being careful not to pierce the skin. Gently scoop out the potato with a spoon. Place the scooped out potato, cooked squash, 1 tablespoon of Earth Balance buttery spread, nutritional yeast, dairy free milk, garlic powder, cayenne, salt and cumin in a large bowl and beat with an electric beater until creamy. Don't over-beat as that will make them gluey. Place the mixture in the scooped out potato skins. Carefully rub a 1/2 teaspoon of soft Earth Balance on the top of each potato. Sprinkle with paprika. Bake or refrigerate until needed. Bake potatoes for about 20 minutes until heated thoroughly. Top the hot potatoes with chives and serve. Per serving: 213.1 calories, 4.8 g fat, 1.0 g saturated fat, 0 mg cholesterol, 5.6 g protein, 37.1 g carbohydrates, 4.8 g dietary fiber and 362 mg sodium.